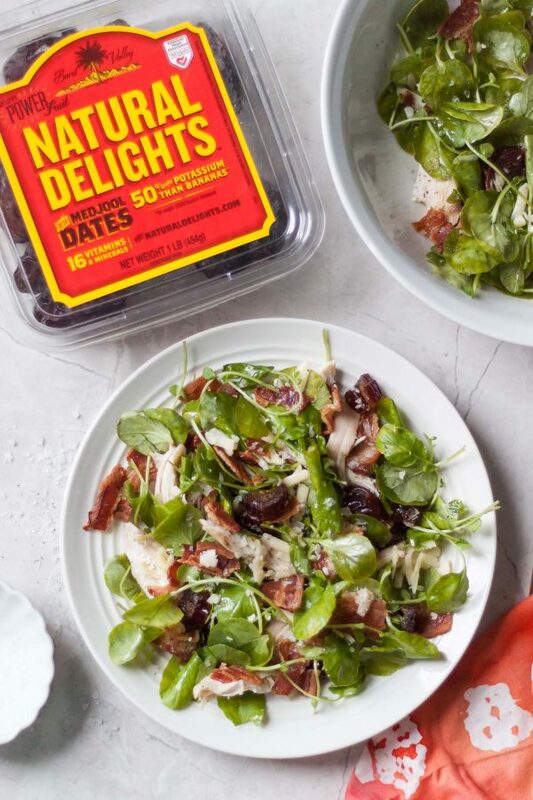 If every salad recipe involved a winning flavor combo like chicken bacon cheddar, we’d certainly eat more of them. 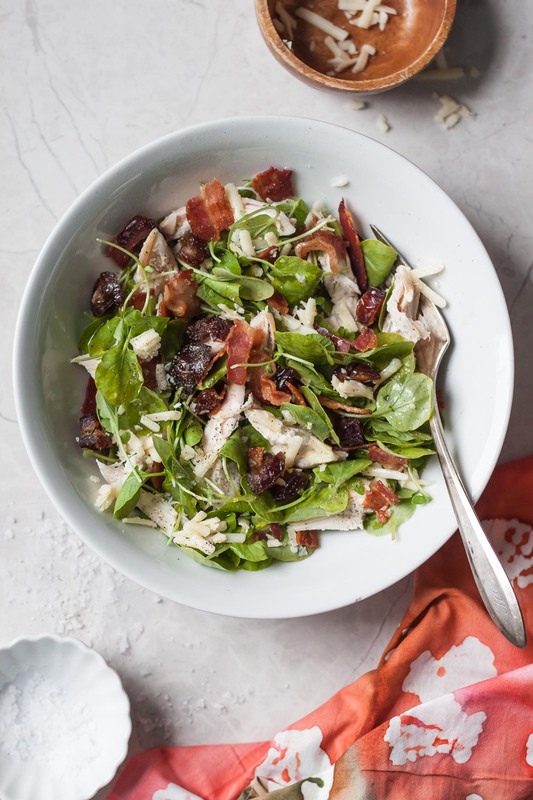 Use a rotisserie chicken to make this chicken bacon cheddar salad recipe easy and fuss-free and watercress adds a mild spiciness that you’ll love with the sharp cheddar, salty bacon, and sweet medjool dates. My hometown had a few things going for it—good schools, Stars Hollow charm, and oddly pleasant people. But a lesser talked about perk of growing up in Medfield, Massachusetts, was the abundance of good sandwich shops (“subs” where I’m from). Back in the 90s and early 2000s, if you had asked anyone around town for a lunch recommendation, they’d have sent you straight to Isabella’s for a Mayflower or a Melanzana—and if not Isabella’s, then to The Deli, for a toasted Chicken Bacon Cheddar. Just thinking about that cheesy, bacon-stuffed blessing takes me way way back to my first boyfriend. Some people have songs that allow them to reminisce—and I have subs. 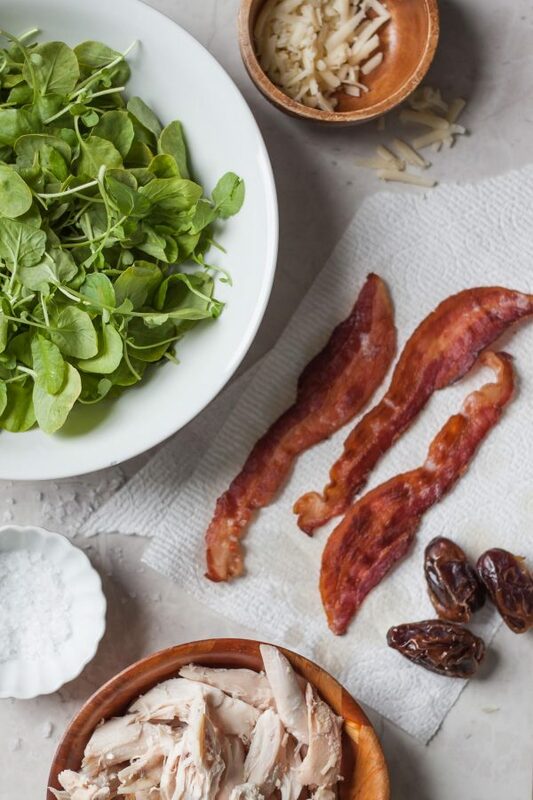 It seemed like high time to make a salad with that winning flavor combo: chicken, bacon, cheddar…plus some help from sweet-as-candy Medjool dates. To save time and make life a little easier post-vertigo/migraine-apocalypse, I picked up a rotisserie chicken from my local grocery store (but roasting your own is always a smart idea!). And rather than reaching for my go-to greens, I decided to try something new: watercress. 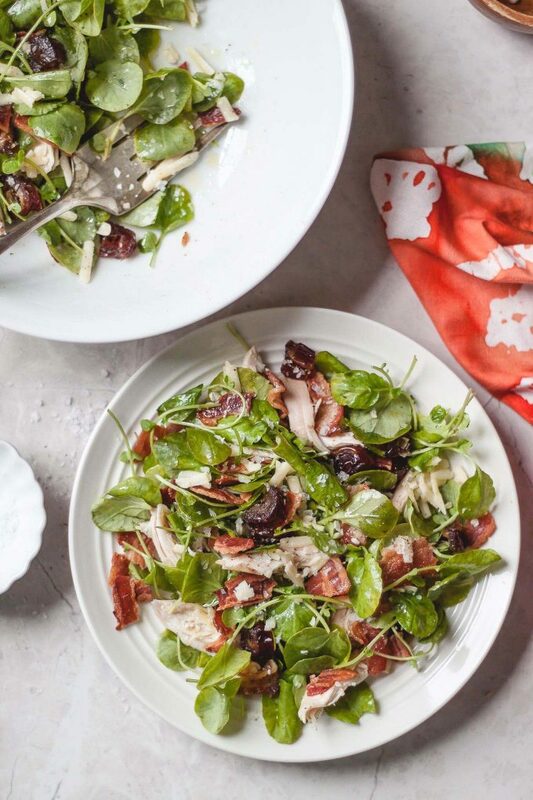 The leaves are light and beautifully delicate, which makes for the prettiest presentation, but it has a peppery flavor similar to arugula and radishes. The slight spiciness of the watercress, blended with baby spinach to tone it down just a bit, is so fresh. It works well with the sharpness of the cheddar, the saltiness of the bacon, and it’s balanced by the naturally sweet bites of Medjool date. The Medjool dates really make a big difference. For one, I have a feeling they were meant for salty bacon. But they’re also packed with fiber and potassium (50% more than bananas, hey!) and are just such a nice departure from other dried fruits I tend to use in salads, like raisins, cranberries, or even apricots. It’s about time I started mixing it up! With chicken, it’s a main course, but without, it’d make a great starter or side dish! Enjoy! In a large bowl, whisk the olive oil, vinegar, Dijon, honey, salt, and pepper. Add the chicken, bacon, cheddar, Medjool dates, and toss. Add the watercress and spinach and toss gently to combine. Divide the salad among 4 serving plates and serve immediately.